Exterior siding has come a long way in the last few decades, causing exterior house painters to be a think of the past. This means that homeowners have a lot of things to consider when choosing the right siding. There are both technical considerations, as well as design considerations. Let’s take a look at some of the things you will want to think about when choosing siding for your home. Most homeowners choose between vinyl and composite siding options. Both types require very little maintenance and if installed correctly by professional contractors, can last a very long time and protect your home from water and storm damage. Vinyl siding is one of the most popular choices on the market. This is because vinyl siding has always been inexpensive, versatile, and durable. Another reason vinyl siding is so popular is that it can be retrofitted over existing materials, cutting down on installation costs. 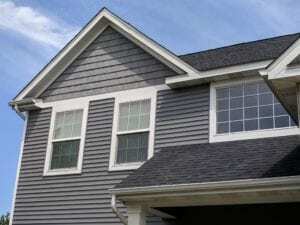 Vinyl siding comes in a wide range color options. Many types, such CetainTeed’s Restoration Classic siding, are fade resistant for the life of your home. This UV protection allows homeowners to choose bright, bold colors without fear of fading. In the past vinyl siding that had woodgrain or other textures didn’t look very realistic, but that has changed. Vinyl comes in almost as many textures as colors, which is great for homeowners switching from wood, or other natural material, siding. Composite Siding is another type of siding created from man-made materials. Composite simply means that the siding is made from a combination of materials mixed together, but not all composites are created equal. 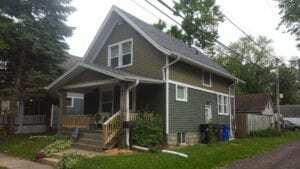 Composite siding has great durability and can last for a very long time if you choose the right type. At Tri-County we consider composite a permanent solution for your home. Just like vinyl, newer composite sidings also come in a huge variety of colors and some contain UV-blocking elements that prevent fading over time. Some of our favorite composite sidings are CertainTeed’s Cedar Impressions, which looks nearly identical to natural wood, and Everlast’s Polymeric siding, which is made primarily of stone instead of wood or cement, which repels water and is extremely durable. In the past, subtle, neutral hues reigned supreme, but today more homeowners are opting for bolder, darker colors like black, charcoal, and dark blues and greens. These dark colors are often paired with a dark roof and white trim to enrich the dark hues of the siding. If a dark color palate doesn’t fit your style, you could try a white or off-white siding with a black or darker trim. This style often uses a dark roof to help the white pop. This style creates a clean and traditional look, but still stands out. 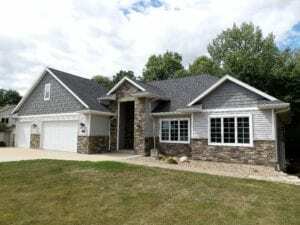 In the past, the textures of vinyl and composite sidings looked less than natural, but siding manufacturers have been able to create some amazingly authentic looking textures. This includes realistic woodgrain textures, but more people are using inorganic sidings that give the look of stone or brick. 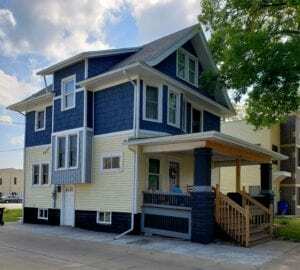 The safe play has always been to use a single color and style of siding on the entire house, but more people are mixing and matching siding styles to create a completely unique look. There’s no “right way,” to mix and match, but some of the looks we’ve loved include mixing in a cedar shingle look with a more traditional paneled siding or incorporating stone veneer with a woodgrain textured siding. No matter what siding choices you decide on, make sure you find professionals to install it. Siding isn’t just about the look, it also helps protect your home against the elements. Without professional installation, you run the risk of having water or storm damage and may have to replace the siding sooner than you would need to if it had been installed properly. Tri-County always provides free, in-person estimates. Give us a call at 319.364.2220 or contact us through our website.